Here are some key events and dates for the American Revolution and the war for independence. The Revolutionary War was between the Kingdom of Great Britain and the Thirteen American colonies. The colonists did not like the way the British were treating them, especially when it came to taxes. Eventually small arguments turned into larger fights and the colonists decided to fight for their own country, independent of Britain. The Stamp Act (March 22, 1765) - Britain sets a tax that requires a stamp on all public documents like newspapers or legal documents. The colonists did not like having this tax placed on them. This led to unrest in the colonies and the Stamp Act Congress (October 1765). The Boston Massacre (March 5, 1770 - 5 Boston colonists are shot by British troops. 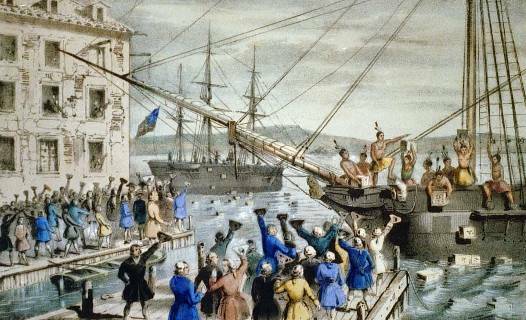 The Boston Tea Party (Dec. 16, 1773) - Angry with a new tax on tea, some Boston colonists calling themselves the Sons of Liberty board British ships and dump crates of tea into the Boston Harbor. The First Continental Congress Meets (Sept. 1774) - Representatives from the colonies get together to unite and oppose British taxes. 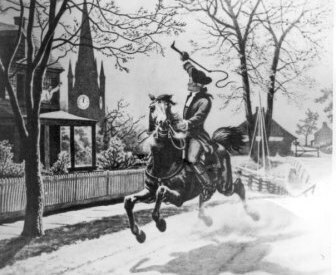 Paul Revere's Ride (April 18, 1775) - The Revolutionary War starts and Paul Revere makes his famous ride to warn the colonists that the "British are coming". Battle of Lexington and Concord (April 19, 1775) - The actual fighting starts with the first "shot heard around the world". The Americans win as the British retreat. Capture of Fort Ticonderoga (May 10, 1775) - The Green Mountain Boys led by Ethan Allen and Benedict Arnold capture Fort Ticonderoga from the British. Battle of Bunker Hill (June 16, 1775) - Major battle where William Prescott told the American troops "don't fire until you see the whites of their eyes". 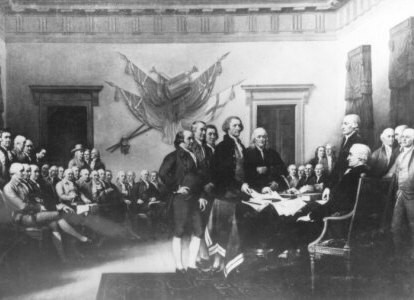 The Declaration of Independence is Adopted (July 4, 1776) - The Continental Congress agrees to Thomas Jefferson's Declaration of Independence. George Washington Crosses the Delaware (Dec. 25, 1776) - George Washington and his troops cross the Delaware River on Christmas night and surprise the enemy. America Chooses a Flag (June 14, 1777) - The Continental Congress adopts the "Stars and Stripes" Flag sewn by Betsy Ross. Battles of Saratoga (September 19 - October 17, 1777) - British General John Burgoyne surrenders his army to the Americans after suffering defeat at the Battles of Saratoga. Valley Forge (Winter of 1777-1778) - The Continental army under George Washington spends the winter training at Valley Forge. Alliance with France (Feb. 16, 1778) - France recognized the United States as an independent country with the Treaty of Alliance. Articles of Confederation (March 2, 1781) - Defined the official government of the United States. Battle of Yorktown (Oct. 19, 1781) - The last major battle of the American Revolutionary War. British General Cornwallis' surrender at Yorktown was the unofficial end to the war. 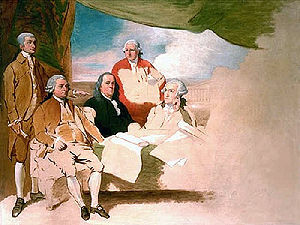 Treaty of Paris (Sept. 3, 1783) - Treaty that officially ended the war.